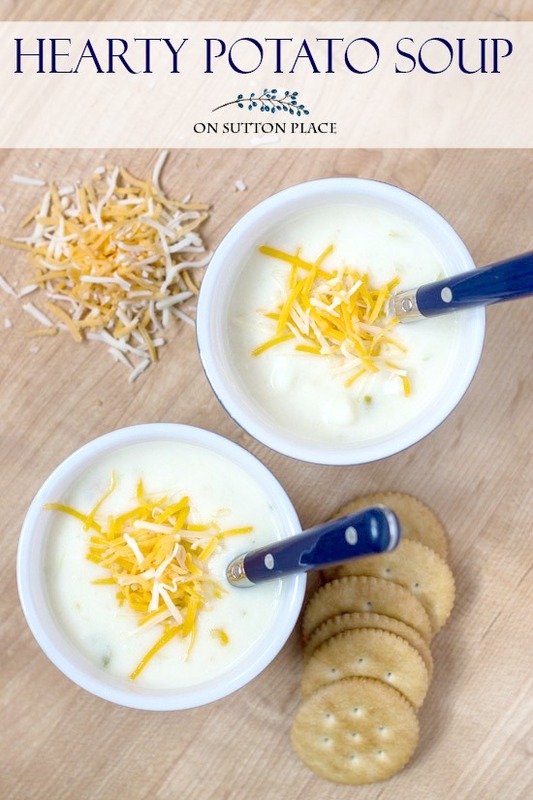 This hearty potato soup recipe has a secret ingredient that gives it amazing taste! Part of the Sunday Supper series at On Sutton Place. At least once a week, sometimes more, I take dinner to my parents. We have a rotation of their favorite dishes but every now and then we try to think of something new. A few weeks ago my dad suggested potato soup but followed it up with the comment that his mother made the best potato soup ever. OK. Was that a challenge? I am not the cook my Grandma was for sure, but I felt like I needed to see what I could come up with. I knew I had a hearty potato soup recipe given to me by a neighbor but I hadn’t made it in years. I dug it out and got started. One of the ingredients that gives this recipe its amazing flavor is the addition of a leek. If you are like me, the first time I made this soup, I wasn’t sure what a leek was. It looks like a giant green onion but has a very different taste. To prepare a leek just chop off both ends and discard. You should have about a 6 inch piece that includes both the green and white parts. It has a lot of layers so wash it very well under running water. Slice it in half length-wise, then slice each half in thirds. Finely chop the 6 slices and add it to your pot. If the layers sort of fall apart just keep chopping. That’s all there is to it. UPDATE 12/18/2015: I feel like I need to say something about my method for chopping a leek. 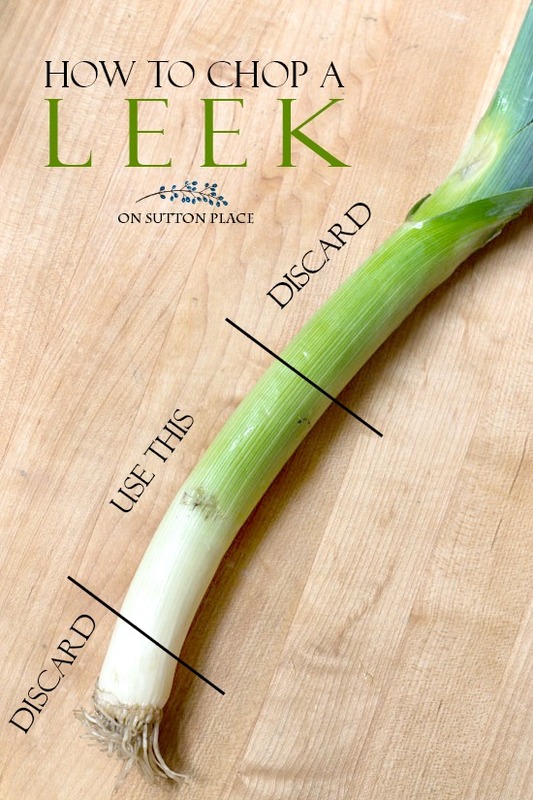 I have had comments on Pinterest from people saying that this method wastes too much of the leek. One woman even called me out on Twitter. If you want to use the whole leek, by all means do so. Personally, I don’t like the dark green ends so I always cut them off. Who knew that a leek could cause such controversy? Ha! The only thing I didn’t like about this hearty potato soup recipe was the fact that it took two pots. Other than that, it was easy and quick. This homemade, hearty potato soup recipe has a secret ingredient that gives it amazing taste! Part of the Sunday Supper series at On Sutton Place. 1 box chicken broth 32 oz. In a large soup pot on medium heat melt 4 Tablespoons butter. Add onion, celery and leek. Saute for 2 minutes. Add chicken broth and potatoes. Cook 10 minutes or until potatoes are fork soft. In a separate sauce pan, melt 5 Tablespoons butter. Add flour and whisk. Combine milk with half-and-half. Slowly pour into flour/butter mixture. Whisk constantly until it comes to a full boil and thickens. Add the milk mixture to the potato/chicken broth pot. Simmer for a few minutes stirring to mix well. Top with grated cheese and crumbled bacon if desired. Drain 2 cans of clams reserving the clam juice. Add the clam juice when you add the chicken broth. Add the reserved clams at the very end right before serving. Both my parents gave it their stamp of approval although my dad did mention he didn’t think his mother’s recipe called for chicken broth. Oh well…can’t win them all. I asked if they wanted it added to the winter rotation and they both said yes. Whew. I try to test all my recipes twice if I can before I post them. The second time I made this I added clams and clam juice to make a New England Clam Chowder. It was really good and got the thumbs up from my husband. UPDATE 4/6/2018: For those of you who have been around for a while, you know my mom passed away in February of 2016. I am in the process of updating and organizing all my recipes. When I came upon this one that mentioned a meal when my mom was alive…well, for just a minute, it felt like she was still here. If you make this soup, I hope you enjoy it with your family. If your mom is close-by, share some with her. and supplies in my Amazon Shop! Click for more Sunday Supper Recipe suggestions! Hi Cathy! You should be able to get six 8 oz. servings from one batch of soup. If you are serving it as the main course and using bigger bowls, I would double the recipe. You could double it anyway and that way you would have leftovers. I hope this helps! I am really anxious to try your soup. Could you tell me what type of flavor the leek has? Is it strong? Like an onion or what? I’ve never tried one. Ps: I love your blog, design ideas and store. Keep up the great work!! Hi Connie…I’m sorry to be so late with an answer. The leek adds the most wonderful taste. It’s not strong at all. If you are worried about the taste, just add half the leek the first time you make the soup. Enjoy! I’m excited to make this yummy soup! Thanks for sharing. Ann, I enjoy your blog so much. I thought I would check out these recipes and they all sound so good. I especially love a rich potato soup and was especially touched by your comment about your mother. It really touched my heart. I certainly would share with my mom if she were still here, although I’m sure she is enjoying a Heavenly Feast! Have a wonderful day and keep your style, home making ideas and recipes coming! I would love to be your neighbor! Love your update, Ann. I just lost my mom. It is so very hard. She made clam chowder, too, so I’m going to make your version in honor of her. AS, this was excellent.. Add 2 strips of crisped bacon (crumbled) and paired it with rosemary crusty bread..Warm winter meal! Ann, I made this tonight and it was so easy and SO GOOD! Next time I will try the clam chowder variation, but this soup stands alone perfectly! I did add a little bacon and chives along with the cheese as a garnish, but it wasn’t really necessary. My husband literally licked the pot clean! 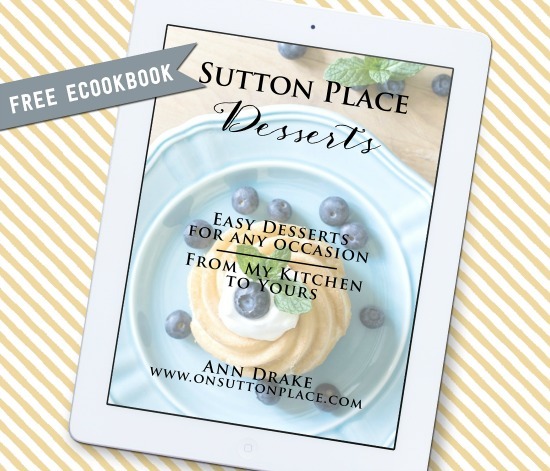 Thank you for all you do for us with your site….your recipes and decor ideas are simple yet elegant and they don’t break the bank in the least. Ann. I have a fix for your two pot issue. After sauté onions leeks etc, add flour on to those. And then add broth. Boil. Then add milk after potatoes done. I also add cauliflower. Love your blog! This looks great. I need to pop some in the slow cooker and have it be ready when I get home from work. Thanks for the tip of working with leeks. my mother made the same soup,I love this !! Mmmm! I’m guessing some crisply fried bacon would be a wonderful addition to your potato soup. bacon was the only ingredient that was missing in every recipe I could find for potato soup.thank you!!! Hi Wil…thank you for taking the time to say hi. Welcome to On Sutton Place! Will have to use leek next time in my potato soup. I always put a dash of cayenne pepper in our potato soup. Really gives it a nice flavor. 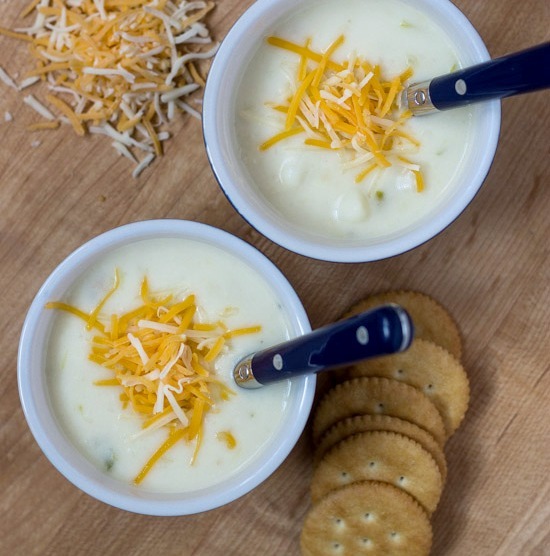 I like potato soup and this recipe looks easy and tasty thanks for your great blogs! Great! I love almost any soup, but potato soup and/or clam chowder are very satisfying and filling, and really fit the bill on these cold (and sometimes nasty) days. Well Ann, you did it again….came up with another winner. I’ll be trying this one. Hope it freezes well. Thanks, and enjoy the upcoming holidays. My Mother never added chicken broth either, but used whole milk from our cow. She also made cornbread griddle cakes for us. This recipes brings back happy memories. Merry Christmas. I enjoy your blog. Thanks Ann. Always looking for good soup recipes. I will be trying it with the clams. Also, it seems it would be good with cooked and chopped thick sliced bacon pieces. I’ll try that and let you know how that turns out. Wishing you and yours a very Merry Christmas! This looks delicious! I am going to go for the New England Clam Chowder – my family loves it but I’ve never tried to make it myself. P.S. I always add chicken broth to my soups! This sounds yummy! I have never used a leek in potatoe soup, so I am going to try it for something different. It is just in time for the cold dreary days we are having. Merry Christmas! I love any kind of soup and also love leeks. I soak mine in cold water and ice for about 20 minutes before using them to get most of the sand out of them. I bet your Dad will love it. LOL! Your Dad cracks me up! It looks delish. We love leeks. I will have to try this. Not being a lover of potatoes I have never made potato soup but hubby and son might like it, so will give your recipe a try. Using a leek will be a new experience. Your a good daughter taking your parents dinner once a week, I am sure they appreciate it. MERRY CHRISTMAS to you and family. I came across your blog when I was searching for free printables! I love your style and I will def give this recipe a try! It’s actually cold in Arizona right now so this soup is perfect ! Thank you so much! Potato soup is one of our family favorites and now we have another favorite to add to our list of soups – Shaker Chicken Noodle Soup. I’ll try a leek next time I make potato soup which is on the menu for next weekend. Keep the delicious recipes coming, Ann. I made your soup today for my husband and myself. We both liked it. I will definitely make it again. Dear Ann, Just wanted to wish you and your family a very Merry Christmas and Happy Healthy New Year. I just love all your ideas and recipes. I look forward every day to hearing from you. Keep it going Ann! Thank you so much for the picture of the leek with the cutting lines…I never knew how to use leeks. I do have a potato soup recipe that I love too but would like to add leeks and now I can! Your recipe sounds delicious and I thought the chicken broth was a great idea…. Thank you Ann for another yummy recipe. I enjoy all your posts and wonderful ideas. I have so enjoyed all your December/Christmas posts this year!